For years, Bose has worked to earn its reputation for unmatched sound and premium quality audio products. The Bose 301 Series II stereo speaker design is a direct example of Bose's long-standing attention to detail. The classic stereo system was built with a calculated asymmetrical design, which balances sound as it travels across the room. The integrated 8-inch subwoofer gives the speaker system a rich, powerful sound and booming bass. Backed by Direct/Reflecting speaker technology, Bose made sure that customers could experience theater quality sound effects and concert stereo crispness from the comfort of their living rooms. Optimized output frequencies makes the 301 Series II's dual frequency crossover network the source for true-to-life sound clarity. Knew these would sound great if undamaged. I was right. Also has great retro style you cannot get in a new pair of Bose speakers. 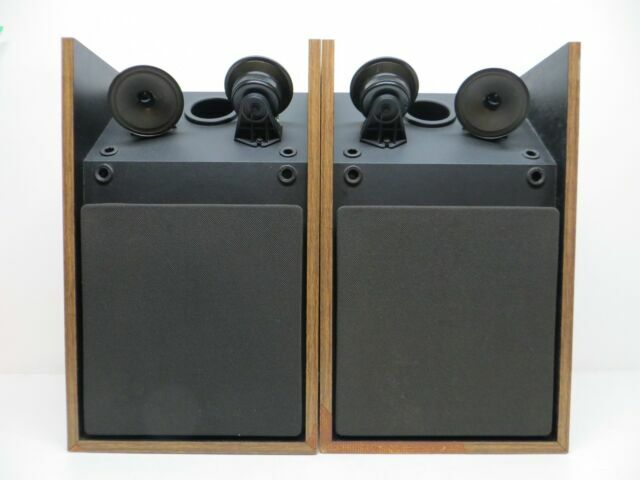 These 301s were at the top of my hit list of speakers to collect and I can say that these are the ultimate choice. The signature Bose sound is amazing and they are a perfect fit in my wall unit. They also play well with my Sony's and my Cerwin Vega's. King Crimson never sounded so good. I missed the crispnes of the high end! King Crimson never sounded so good. The crispness of the bose high end is something I've missed for years. The soundscape is more dimensional w/ these speakers on my shelf. Am I swimming in the music? I will enjoy reintroducing myself to my entire CD and vinyl collection w/ the veil now removed. Clarity is my present state of audiolusciousness, w/ a heavy slice of bass vibe. My old dog even joined in on background vox. That hasn't happend in a while. Can not beat the sound of these speakers!